A doctoral candidate in the Marketing Department at University of Oregon's Lundquist College of Business received the elite Sheth Foundation Dissertation Award at the recent annual meeting in Chicago of the Association for Consumer Research. 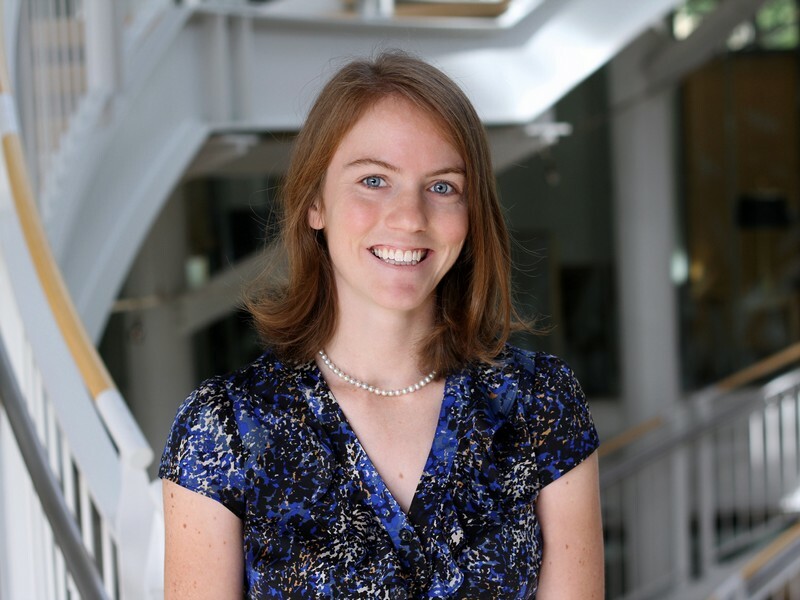 Elizabeth Minton told the UO's business college that she plans to use a $2,000 grant that accompanied the award to pursue research project related to her dissertation. Her work examines how “cause marketing” – putting a charity’s logo on a product’s packaging – can make consumers believe the product is healthier than it may actually be. Congratulate Elizabeth Minton on her award. Lynn Kahle, the Ehrman Giustina Professor of Marketing and head of the Lundquist Marketing Department, said the recognition of Minton's work was gratifying for her and for the department. "It's exciting and impressive to be standing in front of 1,200 people who are applauding your outstanding scholarship," Kahle said in an email to colleagues. "It was probably the proudest moment to be a Duck at ACR since Peter Wright won the ACR Fellow Award." Wright is currently a professor emeritus in Lundquist's Department of Marketing and has served as president and director of the Association for Consumer Research. Minton grew up in Juneau, Alaska, and received her bachelor's degree in 2008 from University of Alaska Southeast and her master's degree in 2009 from Idaho State University – both in business administration. Before starting the doctoral program at the UO, Minton conducted tourism development reviews for a rural tourism development agency and worked in marketing and accounting for an aviation tourism company in Alaska. Her research interests are public policy, services marketing and religion as a determinant of consumer behavior. She has published an article on sustainability in the "Journal of Advertising," has a forthcoming book on religion and marketing, wrote a book chapter on religion and sustainable consumption in production and has several other papers and conference presentations. Minton has accepted an assistant professorship at the University of Wyoming in Laramie, and will start next August. The Association for Consumer Research manages the annual Sheth Dissertation Competition, which is open to anyone pursuing a doctorate in marketing. The Sheth Foundation was founded by Jagdish and Madhu Sheth in 1991, to influence future generations of marketing professionals and inspire innovation in the field. Jagdish Sheth is a marketing professor for the Goizueta Business School at Emory University and an internationally recognized business consultant.